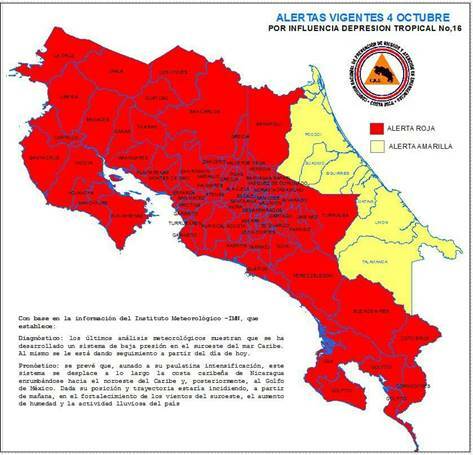 The government of Costa Rica through the National Emergency Commission (CNE) has declared Red Alert due to the heavy rains caused by a Tropical Depression located on the Caribbean Coast of Nicaragua. The National Emergency Commission has issued this alert for the majority of the country excepting the Caribbean Region, which is under yellow alert, the second of the three alert categories. Rincón de la Vieja National Park. The Meteorological Institute also called for increased monitoring in areas prone to landslides or floods. President Luis Guillermo Solis asked today to the authorities of the Emergency Operations Center (COE), to strengthen the actions of care, prevention and protection of citizens and foreign visitors. In case of a thunderstorm and high wind gusts, take shelter in a safe place. Caution to drivers against adverse conditions on roads by rain and fog. Surf conditions along the Pacific Coast of Costa Rica are extremely dangerous for small boat navigation. For swimmers DO NOT get into the sea in these circumstances, due to the danger of currents. For us, at Camino Travel, is necessary to keep our clients and friends informed about this situation. However, it is also as necessary to clarify the fact that the Costa Rican authorities do a remarkable job in preventing tragedies and saving lives. And the emergency network works throughout the whole country. Camino Travel Operations is monitoring this week operation systematically, and we are already in communication with our passengers in the country to prevent and avoid any troublesome situation. If you should have any questions, please do not hesitate in contacting us.